The students at École KLO Middle School are working tirelessly, against all odds, to try to restore the lost turtle habitat on their school grounds which has been covered by concrete pads. But this re-naturalization doesn’t just give the blue-listed Western Painted Turtles a safe place to grow up away from the school’s long jump sandpits. It will create a mutually beneficial learning and growing environment for the human and more-than-human inhabitants in the natural world at École KLO Middle School. The students at École KLO Middle School have been working on a now seven-year struggle to restore the often flooded concrete-covered wetland habitat that once ran through their school grounds. 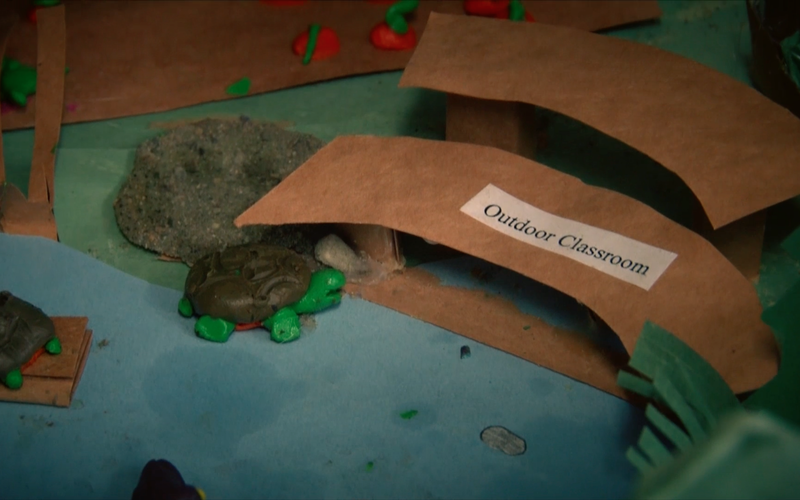 Initiated by students’ discovery of blue-listed Western Painted Turtle eggs in their long jump sand pits, this school’s community began to restore the species’ disappearing habitat. Originally challenged to raise $100,000 their school board for this habitat’s restoration, multiple “generations” of students remarkably raised $86,000 Unfortunately, in an updated quote, these students recently discovered their project will now cost half a million dollars. Although dismayed and disappointed, through work on this issue, the students and teachers involved ended up creating a process of discovery- how the natural world is an educational resource gold mine.